Software grows. That's almost an axiom: As time goes by, more and more features appear... a little bell here, an extra whistle there, and you end up with a behemoth weighed down by its own bloat. WinZip is no stranger to this phenomenon, but its new version 18 fights the trend with new optional add-ons that let you get stuff done without even opening the main WinZip window. 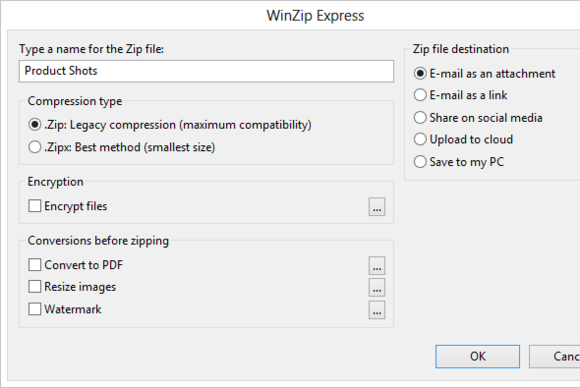 The new WinZip Express add-on isn't flashy, but is clear and useful. The most useful add-on is one you can get for free: WinZip Express for Explorer. Once installed, it shows up in Explorer's right-click menu. Select a bunch of files, and click Zip and Share (WinZip Express). A simple dialog instantly appears. Its plain looks modestly conceal its power: This one dialog effectively replaces the big WinZip window for most users. The WinZip Express dialog lets you zip your files in one of two formats, and optionally encrypt either; convert them to PDF; resize and watermark images; and share the resulting archive over email, social media, a cloud storage service, or just put it somewhere on your local machine. Other Express add-ons include Express for Photos, Express for Outlook, and Express for Sharepoint. Each of them requires the full version of WinZip 18 (either $30 Standard or $50 Pro) to be installed, and of course, you're going to need Microsoft Outlook installed if you want to use Express for Outlook. Unfortunately, the only add-on that comes free with WinZip (Standard or Pro) is the aforementioned WinZip Express, and that too is free for a limited time only. 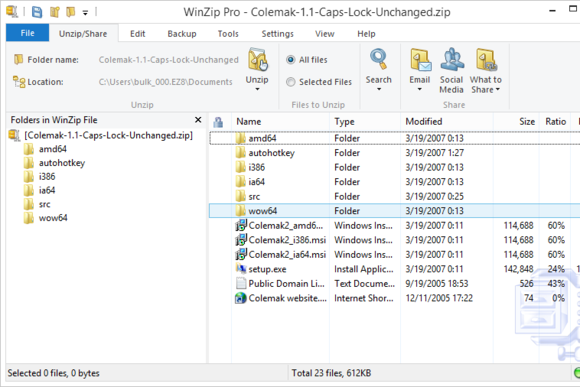 All other add-ons cost $10 and are available from WinZip.com as individual downloads. The Ribbon is still here, and the main interface is as beefy as ever. Looking past the add-ons, WinZip 18 can talk to Box, CloudMe, Dropbox, Google Drive, SkyDrive, and a host of other services. It presents one interface for them all. The main WinZip window retains in Ribbon interface and its large array of features, with a few minor changes to the way items are ordered in the Ribbon. WinZip Pro also adds a cloud-backup option, but it still isn't as full-featured as a dedicated service such as CrashPlan. All in all, WinZip 18 is not a revolutionary release, but the Express add-ons take it in an interesting direction: Suddenly, newer doesn't necessarily mean larger. Now if only they were included in the main product's price. If you're already using WinZip, the new version's Express add-ons will make your life easier.